Shooting hours are one-half hour before sunrise to one-half hour after sunset. Allen North of US 190 east of Kinder, west of US 165 south of Kinder. Avoyelles That portion bounded on the east by the Atchafalaya River, on the north by Red River to the Brouillette Community, on the west by LA 452 from Brouillette to LA 1, on the south by LA 1, eastward to Hamburg, thence by the West Atchafalaya Basin Protection levee southward. Caldwell West of Ouachita River southward to Catahoula Parish line. Catahoula South and west of the Ouachita River from the Caldwell Parish line southward to LA 8 at Harrisonburg, north and west of LA 8 from Harrisonburg to the LaSalle Parish line. ALSO that portion lying east of LA 15. Evangeline North and west of LA 115, north of LA 106 west of LA 115 to US 167, west of US 167 south to LA 10, north of LA 10 west of US 167 to LA 13, west of LA 13 south of LA 10 to Mamou and north of LA 104 west of Mamou. Franklin That portion lying east of LA 17 and east of LA 15 from its juncture with LA 17 at Winnsboro. Iberville West of the Mississippi River. Jefferson Davis North of US 190 from junction with LA 26 to Kinder, west of US 165 and north of I-10 west from junction of US 165. Madison That portion lying east of US 65 from East Carroll Parish line to US 80 and south of US 80. Also, all lands east of the main channel of the Mississippi River. Morehouse West of US 165 from the Arkansas line to the junction of LA 140 at Bonita, north and west of LA 140 to junction of LA 830-4 (Cooper Lake Road), west of LA 830-4 to US 165 at Bastrop, south of US 165 to junction of LA 3051 (Grabault Road) south of LA 3051 to junction of LA 138, west of LA 138 to junction of LA 134, north of LA 134 to the Ouachita Parish line. Ouachita All west of the Ouachita River. That portion east of the Ouachita River lying north of US 80. Richland That portion south of US 80 and east of LA 17. St. Landry That portion bounded on the west by the West Atchafalaya Basin Protection Levee and on the east by the Atchafalaya River. 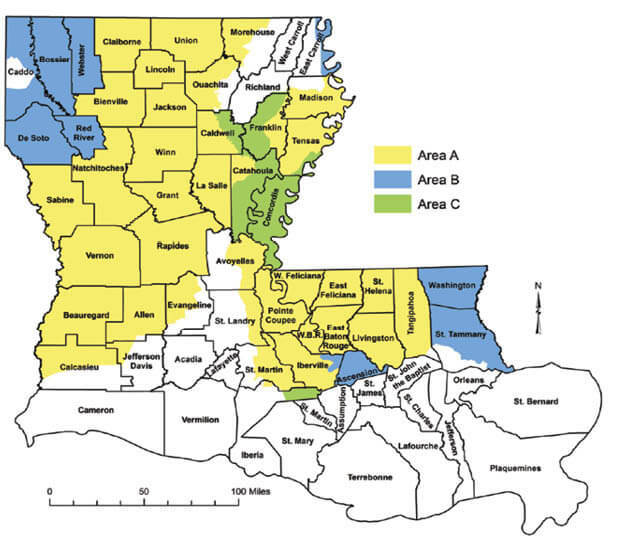 Upper St. Martin All within the Atchafalaya Basin; in addition, that area bounded on the North by LA 352; on the West by LA 349, to LA 3039, to LA 347, to the Catahoula Hwy. (LA 96), to LA 679; and on the South by the parish line. Tensas That portion west of US 65 from the Concordia Parish line to its juncture with LA 128, north of LA 128 to St. Joseph; west and north of LA 605, 604, and 3078 northward to Port Gibson Ferry. Also all lands east of the main channel of the Mississippi River. Caddo All open except that portion north of I-20 from the Texas state line to I-220. West of I-220 to LA 1. West of LA 1 to Caddo Lake. South of Caddo Lake to the Texas state line. East Carroll East of US 65 from Arkansas state line to Madison Parish line. Iberville All east of the Mississippi River. Caldwell All east of the Ouachita River. Catahoula All of the parish EXCEPT for that portion located in Area A.
Franklin West of LA 17 from the Richland Parish line southward to Winnsboro, west of LA 15 southward to the Catahoula Parish line. Iberia East of the West Atchafalaya Basin Protection Levee. Richland West of LA 17 from Franklin Parish line to Ringle Rd., south of Ringle Rd. to Ferguson Rd., south of Ferguson Rd. to Little Rd., south of Little Rd. to Big Creek, east of Big Creek to Franklin Parish line. Tensas East and south of US. 65 from Concordia Parish line to LA 128, south of LA 128 to St. Joseph, east and south of LA 605, 604 and 3078 northward to Port Gibson Ferry.